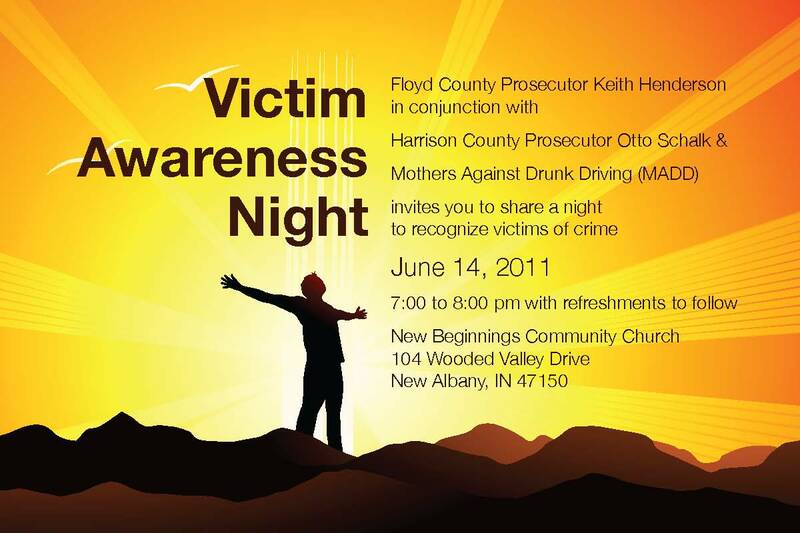 Keith Henderson and the Floyd County Prosecutor’s Office, in conjunction with Harrison County Prosecutor Otto Schalk and Mothers Against Drunk Driving (MADD), are hosting an event to recognize victims of crime. The Floyd County/Harrison County Victim Awareness Night will be held Tuesday, June 14, 2011 at the New Beginnings Community Church in New Albany. The event will begin at 7:00 pm and will last until 8:00 pm; refreshments will follow. The purpose of Victim Awareness Night is to raise awareness of those who suffer as victims of crime and to demonstrate support for them and their family members. Victim Awareness Night is a collaboration of government entities and volunteer organizations that provide services and support to victims. It is the goal of both the Floyd County and Harrison County Prosecutor Offices and MADD that this event exemplifies to victims of crime within our community that help and services are available and that victims have the right to be treated with fairness, dignity, and respect throughout the criminal justice process. The general public is invited and encouraged to attend. New Beginnings Community Church is located at 104 Wooded Valley Drive in New Albany, IN 47150. Questions should be directed to Kristin Pedersen, Victim’s Assistance Coordinator for the Floyd County Prosecutor’s Office, at (812) 948-5422.